The William Blake Archive is pleased to announce the publication of electronic editions of Songs of Innocence Copies I, X, and Z from the Huntington Library and Art Gallery, the National Gallery of Victoria, and the Bayerische Staatsbibliothek, Munich. They join Copies B from the Library of Congress, G from the Yale Center for British Art, L from the Bodleian Library, and U from the Houghton Library. Blake etched the plates of Songs of Innocence in relief, with white-line work in some designs, on thirty-one plates in 1789, the date on the title page. 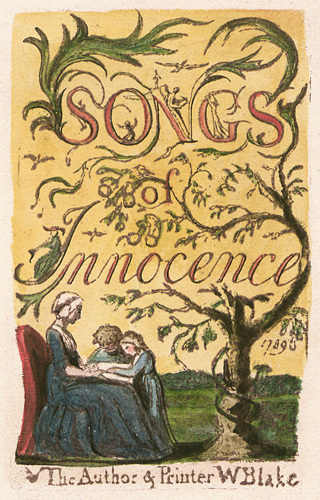 In 1794, for the first copies of the combined Songs of Innocence and of Experience, Blake moved “The Little Girl Lost” and “The Little Girl Found” (plates 34-36) from Innocence to Experience. He moved “The School Boy” and “The Voice of the Ancient Bard” (plates 53, 54) from Innocence to Experience in the last eight copies of Songs. Hence, Innocence evolved from its earliest autonomous copies with thirty-one plates to its last iteration as a twenty-six-plate section in the combined Songs. In Innocence Copy I, all thirty-one plates were printed in green and light blue inks, with several intermediate hues, on both sides of 17 leaves. 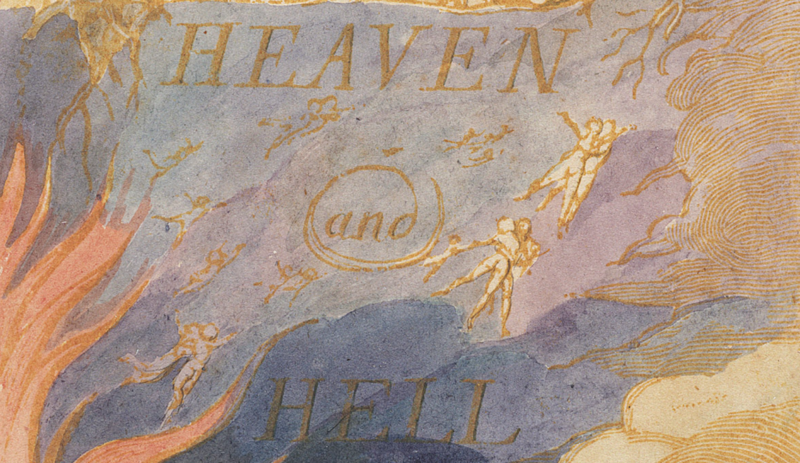 The texts were given light washes, a style of coloring Blake began to use c. 1795, suggesting that this copy was colored later than the other 1789 copies, or refinished before it was sold. Copy I is unusual, though, in having all thirty-one plates that late; for Innocence Copy L, for example, also in the Archive, Blake had extracted plates 34-36, a sign that he had reconfigured and sold it after 1794. The color washes on some plates in copy I have faded badly due to overexposure to light. Innocence Copy I was printed in the same ink colors as—and presumably with—Innocence Copy X and Innocence of Songs Copy F, which is in the Archive. Innocence Copy X is incomplete, with fourteen plates printed on seven leaves, but among them are plates 35 and 36, strongly suggesting that it had initially all thirty-one plates. An eighth leaf, with plates 9 and 10, is in the Fitzwilliam Museum. The simple washes in copy X exemplify Blake’s earliest style of illumination, with just a few light washes applied to the vignettes but the texts left untouched. Innocence Copy Z, also an early copy, was printed after the green issue in the raw sienna ink used for the sets of Innocence in Songs B, C, D, and E (all but Copy D are in the Archive). Copy Z has twenty-seven of thirty-one plates; it is missing plates 27, 34, 35, and 36 printed on two leaves. The same leaves were extracted from Innocence Copy K, though Copy K has plate 27, printed separately on one side of the leaf and added as its last plate. Copy Z is the only copy of Innocence numbered by Blake, which, along with the extracted plates, suggests that it was sold after 1795, when he began numbering his plates. It was acquired in the mid-nineteenth century for the library of Ludwig I of Bavaria. With the publication of Songs of Innocence Copies I, X, and Z, the Archive now contains fully searchable and scalable electronic editions of ninety-eight copies of Blake’s nineteen illuminated books in the context of full bibliographic information about each work, careful diplomatic transcriptions of all texts, detailed descriptions of all images, and extensive bibliographies. New protocols for transcription, which produce improved accuracy and fuller documentation in editors’ notes, have been applied to all copies of Innocence in the Archive. With the Archive’s Compare feature, users can easily juxtapose multiple impressions of any plate across all or selected copies of this or any of the other illuminated books and, with the Virtual Lightbox, users can examine any images in the Archive, as well as crop, zoom, and juxtapose them for close study. Pingback: Publication Announcement – Songs of Innocence copies I, X, and Z | Uncategorized | Aggregated blogs on Romantic Studies - please click through to read full posts.